When it's empty, the convenient handle is there so you can just hang it up until you need it. Why Not Try A New Way to Sit ? It declutter your kid's room and hide all those stuffed animals, that can make a super comfy chair for the ultimate in comfort. Bean bags are designed exclusively to fit the standard of ergonomic position, which enables them to sit comfortably more. All the family can enjoy using. so you can take it outside for a comfy sun lounger or a piece of garden furniture. Standard Size - 24*36.5*21 inch toy bag can fit 100L of filling material or approximately 45+ plush animals. Large Size - 35*50*30 inch toy bag can fit 200L of filling material or approximately 110+ plush animals. 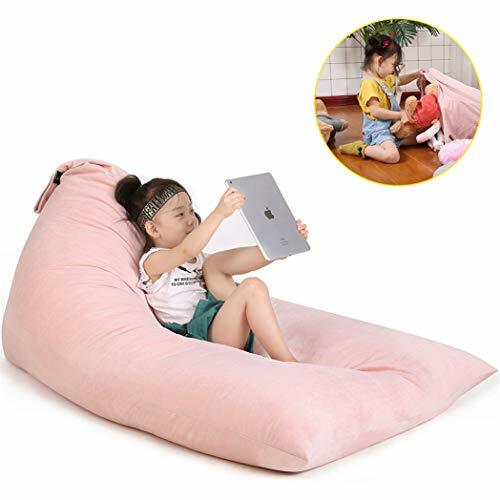 Jorbest stuffed animal storage bean bags come in two different size and a multitude of colors options to make sure it will match any favorite color or decor needs you may have, you can be proud to show in your home. We have used YKK long zipper with all bean bag covers, guaranteed not to lose its qualities over time. Recommend to hand wash, flat out to dry and let it air dry naturally, extended service life. Machine wash with cold water on gentle cycle! Do not expose to direct sunlight. You have no idea how awesome it is to have this thing! So add to cart now!